Eighteen new stamps have been issued by Royal Mail to celebrate Star Wars: The Force Awakens. The set features nine characters from the existing Star Wars franchise and three from the upcoming release. The new characters are Rey, played by Daisy Ridley; Finn, played by John Boyega; and Kylo Ren, whom Adam Driver plays from behind a mask. 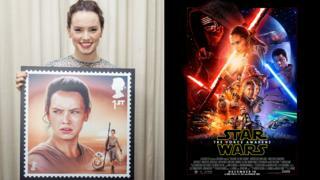 British actress Ridley celebrated by launch by posing with her stamp, which also features robot companion BB-8. Luke Skywalker, Han Solo, Princess Leia and Darth Vader also feature on the set of first class stamps, illustrated by British artist Malcolm Tween. Star Wars: The Force Awakens is out in the UK and Ireland on 17 December.